The 2014-2015 college basketball season has been full of excitement, upsets and triumphs — and the Ducks have been one of the most interesting teams in the Pac-12, but it’s hard to really gauge who they are and how they will perform on any given night. Are they young? Yes. Are they inexperienced? Of course. Will they make you scratch your head and then make you jump up and down in excitement? Sure. 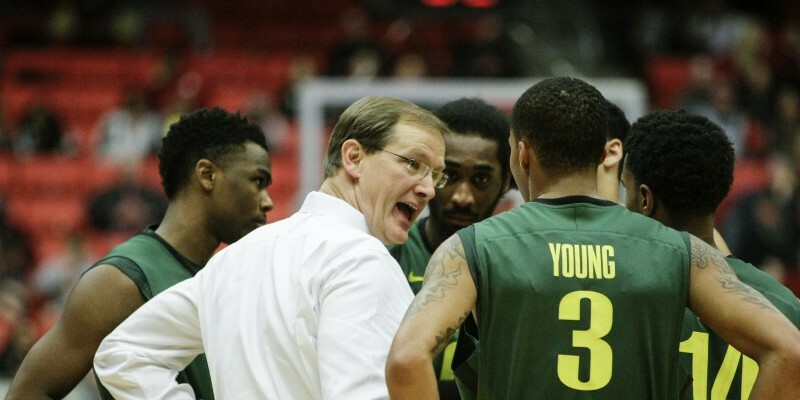 But nobody excepted Oregon to perform the way it has this season, and while the critics placed the Ducks in the lower half of the Pac-12 standings before the year started, Dana Altman has instilled confidence and belief in a club that lacks size, experience, and depth. The Ducks have been the underdogs all year long, but that hasn’t bothered them yet. What Oregon doesn’t lack, however, is a high-octane scorer with the ability to get his shot off at any time. Joseph Young has expanded his game in many ways this season, and it’s translated onto the court. The Pac-12’s second leading scorer wasn’t necessarily considered a great leader before the season started. Yes, he’s always been able to put up big scoring numbers, but the most impressive aspect of Young’s game this season has been his maturation as a vocal leader and his attention to detail in every other phase of the game. Whether he’s leading the defensive drills in practice or setting up the offense during a heated battle against a Pac-12 rival, his actions on and off the court have rubbed off on his young teammates. With only five games left on the regular season schedule, including three road games, the Ducks have an opportunity to finish the season with more than 20 victories, which would make it five straight years with at least 20 wins. The men in green and yellow now find themselves three games back from first place, currently tied with UCLA for third. Considering the loss of personnel the Ducks endured last off-season, it’s almost a miracle they have made it this far. Although it’s probably unlikely that Oregon will qualify for the NCAA Tournament next month, the program has come a long way since the beginning of November, and the young core that the Ducks currently possess will undoubtedly lead them for many years to come. This season, however, isn’t over yet. The Ducks still have some unfinished business.